We Know Shipping Deck Boats! deck boat moved anywhere in the world. Deck boats are very versatile; you can use them to cruise or fish with friends or family, or tailor them to fit your interests with watersports or fishing packages. Make sure your deck boat gets to your next vacation spot safely with Nationwide Boat Shipping. We will prep, shrink wrap, load, and carefully transport your deck boat to the location of your choice. In addition, we will take care of getting all permits and escorts needed to ship your deck boat properly. With our expandable hydraulic trailers, transport is a breeze, whether you are going across the state or across the country. And you will be in continuous contact with the deck boat transport throughout the shipping process, so you will always know where it is. Deck boats are a wonderful way to get the whole family out on the water. 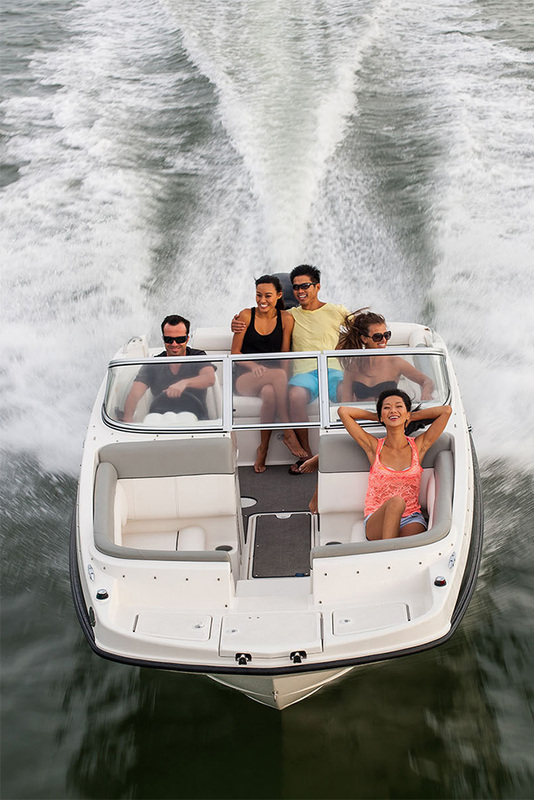 Longer than a bowrider, you can take up to 14 people with you for a day of sun and water fun. Shipping your deck boat can be a bit tricky for the average boat owner. Before shipping, the wraparound windshield and other extraneous parts will be removed and packaged separately for shipping. This protects your property from damage and helps your deck boat fit within the height allowances, either 13'6" or 14', depending on what state you are transporting your boat. The professional boat transport specialists at Nationwide Boat Shipping know how to ship your deck boat properly, to ensure its safe arrival. If your boat exceeds the state height allowance, we will supply a pole car to travel with it. Call (800) 352-8475 to talk with one of our logistics professionals for a free no obligation quote today! Traveling across the country? No problem! Nationwide Boat Shipping provides deck boat shipping to every state in the United States. Whether you are going out for a vacation adventure, moving your deck boat to your new home, or shipping one that you bought at auction, we have got you covered. So, broaden your horizons and enjoy the open water anywhere you choose; our premium deck boat shipping services will ensure that you will soon be out on the water with the wind in your hair. "Our deck boat is like a member of the family as we use it almost every weekend & Nationwide Boat Shipping took great care of her!" "A safe transport & an affordable price - Nationwide Boat Shipping are the only choice when moving your deck boat." "Was worried about getting my deck boad moved across the country & Nationwide Boat Shipping handled everything like true professionals!"